Imran Khan, a Pashtun born in 1952, was one of Pakistan's greatest cricket players of all time, and was once voted as the "Sexiest Man of The Year" by Australia Magazine Oz. He turned to politics in the 1990s, and has become extremely colorful and extremely anti-American. On Sunday, Khan officially began his campaign to become prime minister. 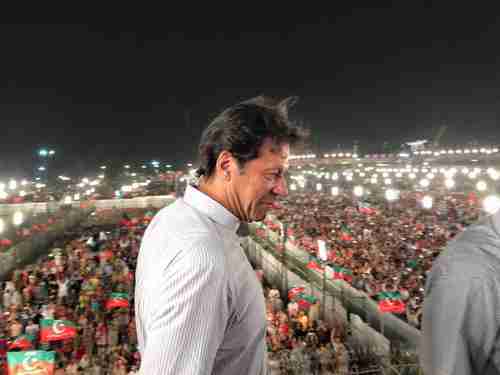 Khan gave what he described as the most important speech of his life to a huge enthusiastic crowd of supporters in Lahore. This was the same venue as the rally in October 2011, when he stunned observers by drawing 100,000 people to the rally, far exceeding expectations. Saying that "It's time for a change," he promised to have closer ties with China, to distance Pakistan from the U.S., and to "convince" India to withdraw its military from the disputed regions of Kashmir and Jammu. Invest maximum on development of people, on education for all. Health facilities will be made available to all. "I will build hospitals in Pakistan where the poor wouldn’t have to worry about money and the rich wouldn’t need to go abroad for treatment." "We don't have money to run countries, we're under heavy debts. I claim in front of you today that I will show you how to gather money from this nation." That will be done by revolutionizing the tax collection system. Eradicate all corruption from Pakistan, one of the most corrupt countries in the world. Revamp investment policy to attract giant investors. "We will reduce the tax on electricity and gas for our industries so that they could compete with Indian market." Eradicate unemployment, and especially focus on boosting the tourism industry of Pakistan. Improve agriculture and the lives of farmers. "Farmers work for the whole year and get nothing in the end. They are being exploited by the sugar mill mafia." Bring Fata (the federally administered tribal area) into the mainstream. Improve the environment, including the planting of 10 billion trees across Pakistan. "We can even clean the rivers." Depoliticize the justice and police system, and eliminate extrajudicial killings. Empower women through education. "Whatever I am today, it’s all because of my mother who made me a patriotic person and raised me to be a truthful person." "The Pakistan that Quaid-e-Azam wanted would afford equal rights to all citizens including the minorities, where the Hindu community, Sikhs, and Christians would be equal citizens. This country was to be formed on the model of Medina, where the basis of law was justice. “We are on crossroads today, on one end it’s disrespect and on the other, it’s dignity." The last sentence refers to Khan's plan to sever all connections that Pakistan has to the United States, claiming that instead of being disrespected by the U.S., this move would restore Pakistan's dignity. Pakistan has been plagued by frequent terrorist attacks by al-Qaeda linked jihadist groups, usually part of Tehrik-e-Taliban (TTP, Pakistan Taliban). These attacks have particularly targeted religious minorities in Pakistan. Shia Muslims are targeted most often, along with Hindus, Ahmadis and Christians. In his speech on Sunday, Khan gave lip service to a Pakistan "where the Hindu community, Sikhs, and Christians would be equal citizens." However, the Taliban are radicalized Pashtuns, and Khan himself is a Pashtun, and appears to be sympathetic to the Taliban. He's openly supporting the Afghanistan Taliban. Even though it's clear that the attacks in Pakistan by the Taliban are sectarian based, Khan insists on blaming them on the Americans and, in particular, by American drone strikes on Taliban terrorists in the Fata (federally administered tribal area along the border with Afghanistan). In 2013 he got his followers to blockade the "Khyber pass," a major route into Afghanistan that is heavily used by Nato forces to truck equipment between the port of Karachi and Nato bases in Afghanistan. The blockade finally ended in February 2014. On January 1 of this year, US president Donald Trump tweeted that Pakistan had given nothing to the US but "lies and deceit" and provided "safe haven" to terrorists in return for $33 billion aid over the last 15 years, thinking of American leaders as "fools." "Two immediate measures can be taken by Pakistan to send an unambiguous message to the US: One, we must immediately remove excessive US diplomatic, non-diplomatic and intelligence personnel from Pakistan, so that diplomatic parity is established according to international legal norms governing diplomatic relations between two states. Two, we must deny the US GLOC and AIRLOC facilities which we were providing free of cost to the US. .. The lesson we must learn is never to be used by other for short-term paltry financial benefits ever again. We became a US proxy for a war against the Soviet Union when it entered Afghanistan and we allowed the CIA to create, train and arm Jihadi group on our soil and a decade later we tried to eliminate them as terrorists on US orders." The last paragraph refers to the 1980s Soviet Union invasion of Afghanistan, when the US secretly funded anti-Soviet Saudi rebels who later turned into al-Qaeda. 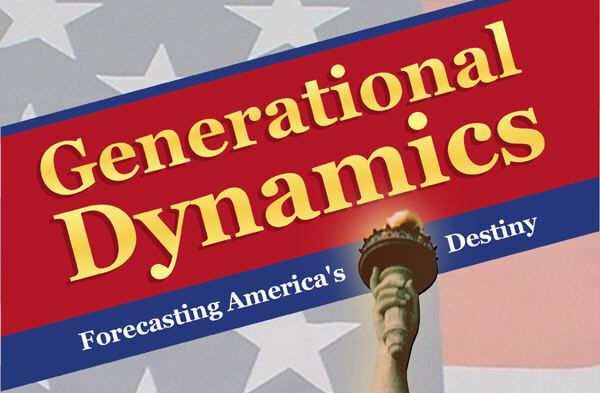 As regular readers are aware, Generational Dynamics predicts that the approaching Clash of Civilizations world war will pit China, Pakistan and the Sunni Muslim countries against the US, India, Russia and Iran. In the Mideast, Generational Dynamics predicts a full-scale Mideast war, pitting Jews against Arabs, Sunnis against Shias, and various ethnic groups against each other.